Weeeeeeeeee, spent yesterday evening and today with some really great folks. I've been writing for Weblogsinc since June 6, and after the recent announcement last month regarding AOL's purchase of Weblogsinc, I'm finally able to put faces to names. The powers that be put together a little retreat for everyone that could make it in the heart of NYC, at the old Timewarner offices (now serving some of AOL's personnel) at 75 Rockefeller Plaza. Met all the big guys, like the Engadget team, Autoblog team, fun loving TUAW team, co-founders Jason and Brian and it turns out... yup everyone is extremely chill. Had some great conversations with Tom of AdJab (among others), Martha, Kim, and Jay of Cinematical (among others) and even spoke to Judith for some time about the future of the design blog. Met Mike, Weblogsinc's resident designer and brainstormed about the design process whenever the design blog moves over to the new and very awesome Blogsmith platform. Really fortunate to be around good people at my day job AND freelance activities. 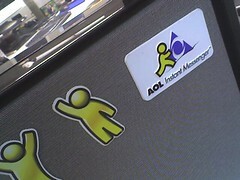 yo...i gotta visit you from 75 rockefeller...i hope google buys aol...!